Geoff Robb was the winner of the 2018 Brighton Fringe Live Music Award and since then he has been writing music inspired by trees. His beautiful meditative compositions blend his classical training with his love of Spanish and Celtic music. He plays on both nylon and steel string guitars including a guitar he built himself and has been performing to audiences all over the UK and beyond from Buckingham Palace to Glastonbury Festival. Andrew Scott is a classical guitarist with a passion for jazz. He studied with many of the leading musicians in the guitar world including Carlos Bonell and made a solo tour of the former USSR in 1998 then produced his debut CD in 2003. Andrew has played in many festivals around the UK and works with the Corcovado Jazz Trio. He will be playing tracks from his new solo album Andrew Scott Plays Laurindo Almeida. Almeida who was a Hollywood composer and classical guitarist who wrote beautiful arrangements of movie themes, which have now become jazz standards. 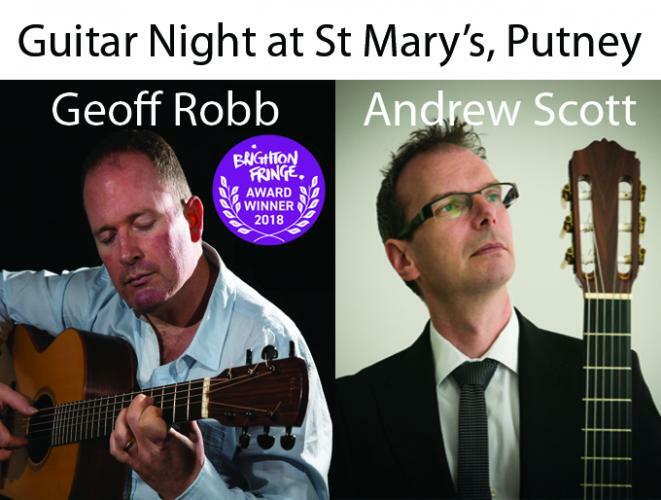 If you enjoy beautiful acoustic guitar music then don’t miss this double bill.